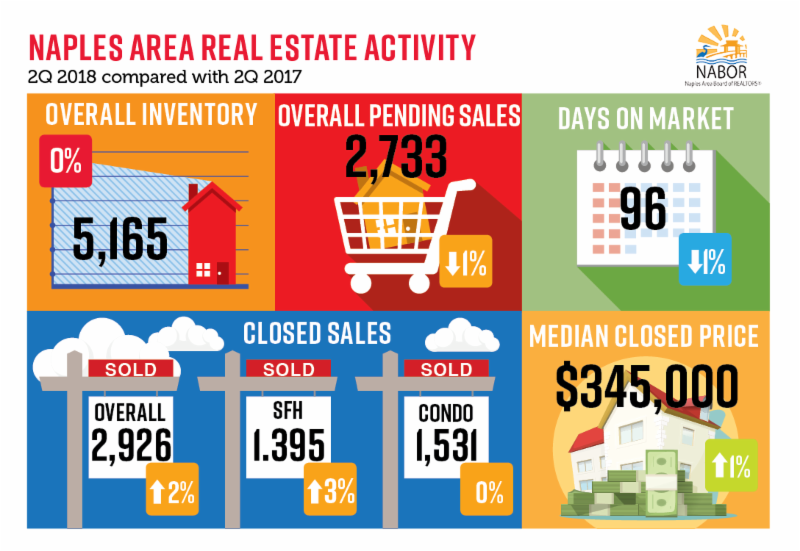 Naples, Fla. (July 13, 2018) - Activity in the Naples area housing market during the Second Quarter of 2018 remained steady in comparison to activity during the Second Quarter of 2017. According to the 2Q 2018 Market Report released by the Naples Area Board of REALTORS® (NABOR®), which tracks home listings and sales within Collier County (excluding Marco Island), overall closed sales increased 2 percent to 2,926 properties in the 2Q of 2018 from 2,880 in the 2Q of 2017. But in the $2 million and above single-family home market, closed sales rose 25 percent in the 2Q of 2018, which-along with other market indicators-leads many broker analysts to believe that interest in luxury homes will remain in high demand. Available inventory at the end of the 2Q of 2018 was 5,165 properties, just 24 units behind the inventory level at the end of the 2Q of 2017 (5,189 properties). "This tells me that homes are coming onto the market at the same rate we are selling them," said Mike Hughes, Vice President and General Manager for Downing-Frye Realty, Inc. Inventory rose 15 percent in the $2 million and above condominium market during the 2Q of 2018, which may be a factor in the uptick of pending sales in the luxury condominium market as it rose 32 percent during the 2Q of 2018. "Inventory in other parts of the state and nation are stretched thin, hovering between 3 and 4 months of inventory, but Naples enjoys almost 7 months of inventory," said Budge Huskey, President, Premier Sotheby's International Realty. "What's even more impressive is that we have such a great selection of homes for buyers despite the recent increase in sales and still having some undergoing repairs from Hurricane Irma." "We are seeing a very different sales environment locally from that of 10 years ago when home sales in northern states stalled," said Coco Amar, a managing broker at John R. Wood Properties. "But now that homes are moving fast up north, sales of high-end single-family homes in Naples are stronger than ever." "It's hard to ignore the increase in interest for ultra-luxury properties," said Huskey. "A $48.8 million sale for a home in Naples is impressive, but when you learn there was a second potential buyer who was considering the property you know what type of buyers are in the market." According to Adam Vellano, West Coast Sales Manager, BEX Realty - Florida, there were four property sales over $10 million during the 2Q. "It's possible the new tax laws are impacting people's minds about residency and we're benefiting from it." Brokers analyzing the market report agreed that multiple offers on luxury properties have risen. But whatever factor(s) is driving the increased interest, closed sales of luxury homes over $2 million are positioned to rise again as the stage has been set in the 2Q where pending sales in this price category increased 22 percent for single-family homes and 32 percent for condominiums. The real estate market's stability during the 2Q also extended to its median closed prices which increased only 1 percent to $345,000 in the 2Q of 2018 from $340,000 in the 2Q of 2017. However, despite increased sales in nearly every price category for properties priced above $300,000 during the 2Q of 2018, the median closed prices for properties above $300,000 decreased 5 percent! As pointed out by Vellano, sales of single-family homes near Naples Beach and in the expanding North Naples area saw the greatest increase during the 2Q, and condominium sales in Central Naples outpaced all other home type sales during the 2Q. "According to the report, we averaged 30 transactions a day during the 2Q," said Vellano. "That's good news for REALTORS® as we move into the summer months." If you are looking to sell a home in Naples, contact a REALTOR® who has the experience and knowledge to provide an accurate market comparison so you can determine the right asking price. A REALTOR® can also ensure your next purchase in the Naples area is a success.